With some luscious chiming, chorus-soaked guitar, jittery drumming, wandering bass and vocals reminiscent of Mark E Smith circa 1978, Treeboy & Arc’s latest – released through Leeds label Come Play With Me’s singles club, sharing a 7” with Japan’s Jebiotto in a joint effort with Japanese Label Call & Response – is a belter. As has become CPWM’s signature, this split single showcases a brace of contrasting but complimentary acts, each contributing a classically single-length single – if that makes sense. The medium is the message: 7” singles were, and remain, an artform. Brevity is the key. Giving enough, while leaving the listener wanting more. 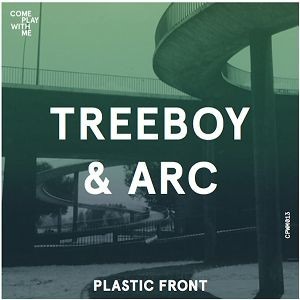 And in three and a half minutes, Treeboy & Arc do exactly that, combining hooks with edge, packed into a hell-for-leather song about a car crash. Jebiotto’s contribution is a shade further off-kilter and a little more difficult, but that’s the benefit and joy of a split 7”. It’s a taster, there’s no commitment, and if one side’s stellar, you’re made. If the other side’s got grower potential, then it’s a double win. And this is very much a double win.